The bridge project at Nelsonville is progressing. As with every major scenery project I've undertaken, plans change as you get further into it. Once the bridges were in place, the next step was to work on the railings. But I realized that I would have to lean over them to finish the scenery around the station. And that was sure recipe for disaster- and broken railings. So I finished up the scenery around and behind the station first. Here are a couple of shots of progress so far. 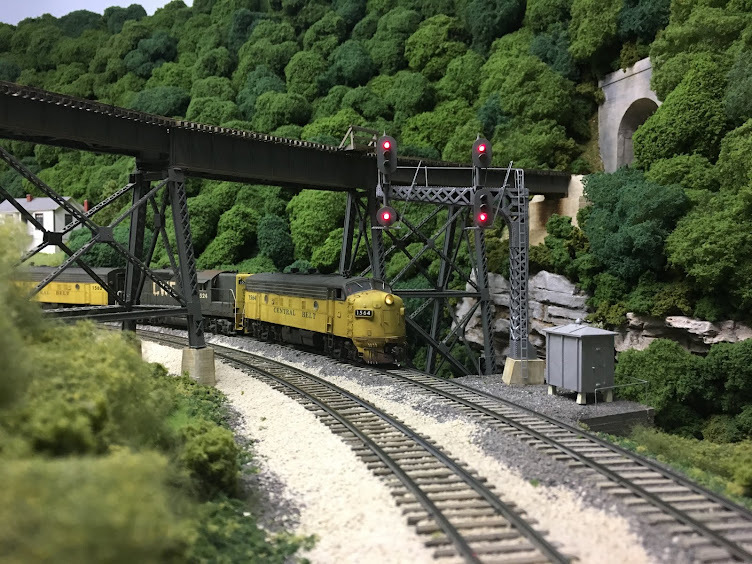 I'm now working on the two signals that will control eastbound movements at the east end of Nelsonville (the branch coming onto the main in the upper left hand corner of the photo above and just to the left of the photo on the main). Slowly but surely, progress is being made!